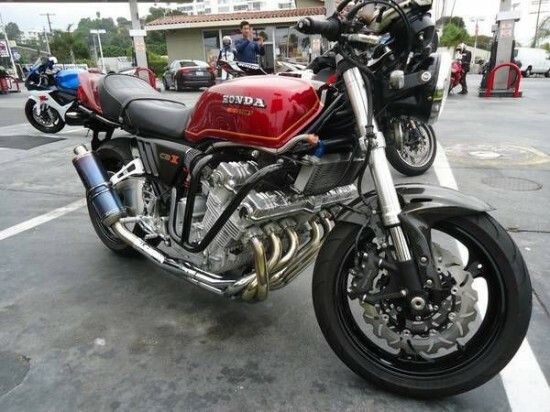 I remember my first real contact with the Honda CBX: I saw a bank of six carburetors in a glass case at The Garage Company in Los Angeles, and I could just picture the finned aluminum beast it must have fed. 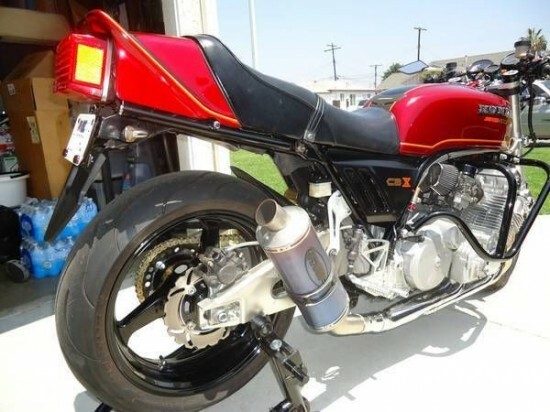 They say that “there’s no kill like overkill” and, for all its bland looks, the CBX would be largely forgotten today, but for the seemingly massive six-pot mill slung across the frame and that sweet, sweet music as it revs. The epic CBX was introduced in 1979 and meant to evoke Honda’s 1960’s GP machines, although the transversely-mounted, 1047cc, 24-valve straight-six motor shared nothing but engine layout with those classic racers that inspired it. At 600lbs, the CBX had no real sporting aspiration: cast as a sports-tourer, it seems a strange choice and sales were modest, for a Honda. After several years, the bike was restyled to include a large, Goldwing-esque fairing to enhance its sporting mission, but the simplicity of the earlier models wins out for me over the increased functionality. 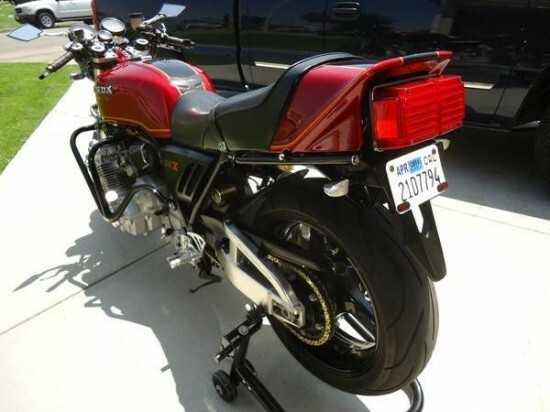 Hi i’m selling my custom 1979 honda CBX, all work done by me at the machine shop. The bike has around 200 hours of labor! Clean title, 2014 tags, 30k original miles, 850 miles on new GPS installed. Front suspension 07 CBR 1000, rear suspension 07 CBR 600, Custom disk brakes, fresh paint job using original colors, Rims and engine guard powder coated black, new chain, new sprocket, new Michelin 2CT pilot tires, hydraulic clutch, rebuilt and jetted carburetors , K&N air filters, new vacuum & fuel hoses, new spark plugs, 6-1 chrome header, FMF exhaust, VORTEX rear sets, Custom levers, new oil pressure gauge, custom aluminum mirrors, real carbon fiber fenders. 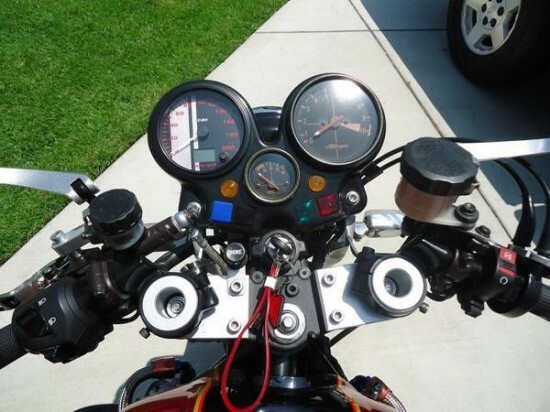 Bike runs perfect! Incredible 6 cyl sound! Very hard to find one on these conditions! The bike looks equal or better than pictures. No lies. Unique CBX on California! This looks to be a very nicely updated CBX, with a few modern components to upgrade the handling, including suspension and wheels. The engine guard spoils the looks somewhat, but the black paint helps minimize the impact, and the installation is a wise move. Those outside cylinders will get torn up in a crash, and the owner clearly built this one to ride hard. I only wish the seller had included a clip of it running! 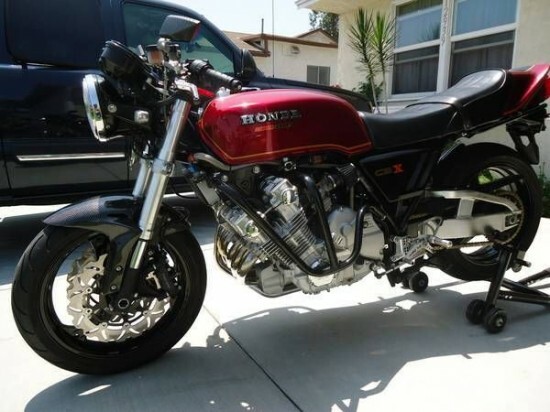 It’s a shame Honda’s innate conservatism won out with the CBX. What if a smaller-displacement, six-cylinder sportbike had been introduced earlier to capitalize on their rich racing history? A halo machine produced in limited quantities and priced accordingly? Who knows how well it would have sold, but one can imagine, based on bikes like this CBX, what the result would have been like.